Run PCR with preset GoTaq settings. Need to ask Dr. Haynes to be certain settings are correct for my reactions. 30 μL --> 37°C/ ~10 min. Vi helped me with running gel because I had class. Vi will put digest into gel and will get results. I believe that I did not wait long enough after I microwaved the gel to put in the ethnium bromide. I need to be sure that I wait until its cooled down. Vi cut gel and has it available for me to work on tomorrow afternoon. 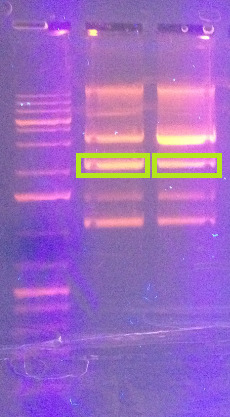 Vi also took out my PCR reaction. She told me that the lid was not closed all the way, so I may need to redo rxns.